Attending a performance of The Rocky Horror Show (running now at 6th Street Playhouse) is akin to attending a college Halloween house party – you’re going to be surrounded by young people in garish makeup and outlandish costumes playing music and singing songs while engaged in various acts of debauchery, broken up by the occasional visit from the old man next door. If you’re ok with that, fine, you’ll have a good time. If not, well, what did you expect? It’s a Halloween party! What’s often lost in all the madness and mayhem going on in this show is the quality of the score and lyrics, handled well in this production by Music Director Justin Pyne, the small “Rocky Horror Band” and the on-stage performers. O’Brien’s songs are clever, funny and often emotional. From the registry of sci-fi and horror films in the opening’s “Science Fiction Double Feature” to the infectious silliness of the “Time Warp” to the wistful longings of “I’m Going Home”, O’Brien has written a score that, because of its film success, never really got its due as a classic of modern musical theatre. The cast, under the direction of Craig Miller, is obviously having a blast with this show. They all, from leads to supporting characters to ensemble, have their moments. 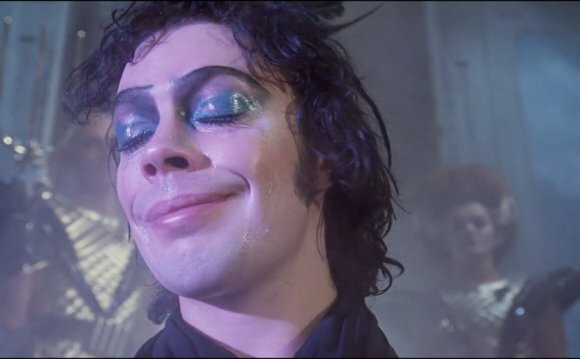 Among them, Broadhurst’s Frank ‘N’ Furter seems to owe as much to a late career Lucille Ball (or a drag queen impersonation thereof) as Tim Curry, and it works. Mark Bradbury brings Brad to life in all his awkward geekiness. Zac Schuman has fun with the dual roles of Eddie and Dr. Scott. Potential attendees whose only familiarity with this show is via the film should be forewarned to leave the props at home – no rice, no toast, no squirt guns, no toilet paper, etc. Not that audience participation is discouraged (far from it), but that participation is limited to audience “call backs”. These “call backs” (where the audience responds, usually quite crudely, to a line spoken by a character) have grown exponentially since my first “Rocky Horror” experience way back in 1977, and the local flavor added to some is a nice touch. That being said, uninitiated audience members may soon grow weary of someone sitting behind them constantly shouting often-foul things into their ears. You have been warned. The Rocky Horror Show is about as far as you can get from traditional theatre. It is not a show where you can sit back in your seat and watch the proceedings unfold before you. It unfolds in front of you, bedside you, behind you, and above you. Like a good Halloween party, it’s colorful, brash, amusing, disturbing, weirdly sexual, occasionally gross, often crude, frequently tasteless and above all fun – but you have to be in the right mood to really enjoy it. To assist in that mood, consider responsibly enjoying a few “adult” refreshments before the show. Hell, they even encourage you to enjoy them during the show (via their concession stand.) And don’t worry about the aforementioned bleak ending getting you down. The cast and musicians will have you “Time Warping” on the stage floor on your way out.